Ilorin – Minister of Information and Culture, Alh. 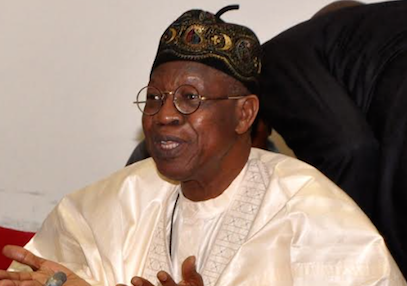 Lai Mohammed has boasted that 2019 general elections would be a walkover for the ruling All Progressive Congress, APC. The minister made the claim at a live programme when he visited the NTA network station, ilorin on Saturday as part of his ongoing tour of federal government’s projects in the North Central zone of the country. He maintained the Muhammadu Buhari’s administration has done so much to improve infrastructure development, as a departure from the past days of neglect and misapplication of project funds. “One of the major challenges we are facing is that we have refused to put money in individuals pockets, rather we have resolved to make sure that whatever resources that is available to this government, will be used for the benefit of Nigerians. “I can see what the infrastructure projects we are doing across the country can do in the people’s lives and economy. Continuing, Mohammed said, “We need to know where we started for us to appreciate what has been achieved by this government. “Our foreign reserves went to almost zero. There was nothing called Social Intervention Programme, our education system went down. Therefore, we need to know where we started for anybody to appreciate what this government has done. We must know what we inherited,” he added. On power, the minister explained that “When we came in 2015, the entire generating companies were generating only 5690mw for a population of 190m people. But in less than two and half years, this administration has generated 7000mw. On foreign reserves, he contended that the administration has built the reserve to an enviable level. “When we came in 2015, the entire foreign reserve was under $24m, but today, we have built our reserves to more than $47m. “Also, when we came in, Nigeria was 169 in the World bank ranking of Easy of Doing Business, and coming from bottom by putting programmes and friendly activities, within one year, we rose fro 169 to 145, adjudged as the most 10th reformed economies in the world. All these impact directly on the people and help foreign investment and encourage confidence in the economy. “We have social investment programme with four components: N-Power, GEEP, School Feeding programme and Conditional Cash Transfer. “Under the SFP, the government feeds over 8.5m pupils one meal a day in 16 states of the federation. Under M-Power, 200,000 graduates were employed and another 300,000 will resume before the end of this month. “Under CCT, 300,000 most vulnerable people receive stipends of N5,000 every month in collaboration with World bank. Under GEEP, over 400,000 cooperatives have been empowered and individuals between N50,000-100,000. Also aiming 2m petty traders to benefit. He said before the administration came in, “we were importing about 58,000 metric tons of rice and today have cut it down to 25,000 metric tons, in the process saving Nigeria $5m every day from rice importation. “Through Anchor Borrowers Programme, has increased number of Rice farmers from 5m to 11 million. “We have also increased number of rice integrated processing farmer from 13 to 21. “Our fertilizer programme, we are blending fertilizer to bring the price down from N11,000 to N5,000. For anybody to say, what is this government doing, is not fair,” said the minister. Why he will not contest election in Kwara. The minister further gave reasons why he will not be seeking elective position in Kwara state. He said: “I am the most senior surviving member of my party in this government from Kwara state as a result of the Tsunami that took place and unfortunately, my state happened to be the epicentre of that rebellion. “If I now want to play the honest broker, I must be above-board, I must not be seen contesting with those I want to lead, or those that look up to me. ” I can’t be fighting for the same thing they are looking for. Therefore, if I have an intention of contesting for any position, the circumstances of today have completely ruled me out because if I am today expected to coordinate and rebuild the party in Kwara state, I do not need to be distracted and unqualified for such a role if I am also seeking to run, I have to disqualify myself,” he stated. On the recent US trip, Alh. Mohammrd said he embarked on the trip to correct the negative impression naysayers were spreading about Nigerian government, especially as it concerns the controversial herdsmen/farmers clash in the North Centrak region of the country. “We embarked on the US trip to meet Stakeholders. What happens in Nigeria today is of tremendous importance to the world. purely environmental and demographic issues. “Religion and ethnicity can be exploited to distract a government and they can be very emotional. Many of them went to US to misrepresent what is happening in Benue State and Taraba as Islamic Jihadists, that this government has Islamic agenda. “We had to go to US to address foreign media to state the facts in the right perspective. “We felt they must see what is happening in Nigeria from the right perspectives, that Herdsmen/Farmers clashes has nothing to do with religion but is about demography and environment. “It is the same land and grass that 45m people were sharing that 190m are sharing today. “Again, climate change, the 95,000 square metres of lake Chad in 1960s has shrunk today. “Of course, there must be criminality and we reminded them that the first farmers/herdsmen clash was recorded in 1945. All these we did to show that those reporting the misinformation were mischievous,” he explained. The minister also pointed out that the herdsmen/farmers clash has gone down because of the proactive steps being taken by the federal government. His words: “Today, the clashes between herdsmen and farmers has gone down because of the proactive measures this government has taken, including the setting up of 16 new mobile police units, new military platforms. “Today, we thank God the killings has gone down. Unfortunately, this is not reported. What we see that happen between farmers and herdsmen today has nothing to do with religion and ethnicity. 70% of prison inmates in Kebbi state are mostly Fulanis. “The feedback we are getting is that our trip to US has paid off, we must make people write in the right perspective. On the 2019 general elections, Alh. Mohammed lamented that the greatest danger of the 2019 general elections will be fake news and hate speech, which he said have become the greatest threat to the corporate existence of Nigeria. “Fake news is as old as printing machine itself. Over centuries, fake news and hate speeches have played negative role in human development. No part of the globe is safe from fake news, it is a global concern. “Our concern is that the purveyors of fake news have taken advantage of technology to spread fake news. “We must make it clear that in our fight against fake news, we will not resort to censorship, even though, it is happening in some parts of the world. “We urge people to subject every story to some tests. The authenticity of the source. The believability is what borders us about fake news. We need the media to partner with us. “Together, we are thinking of having a workshop on fake news. At the end of the day, even the media may be the worst hit of fake news,” he added.